Winters in THE RUSSIANS ARE COMING, THE RUSSIANS ARE COMING. Jonathan Winters was born on November 11,1925 in Dayton, Ohio. He was a very close friend of Robin Williams (the two paired up for the TV show Mork & Mindy (1978) with much of their material ad-libbed. Winters got his start in show business by winning a talent contest. This led to a children's TV show in Dayton in 1950. He also then got a game show and a talk show. Jonathan Winters made 10 comedy recordings for which he was nominated for the Grammy 10 times and won once. 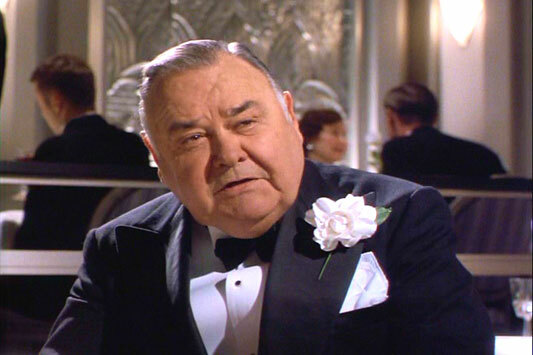 During World War II Jonathan Winters served in the Marines. Winters was an accomplished abstract painter. He's painted a series of abstractionist artwork which was collected into a book entitled Hang Ups. Jonathan Winters in THE SHADOW (1994). Jonathan Winters, with Silvers, in IT'S A MAD, MAD, MAD, MAD WORLD.